Me: Eiks… What’s that ugly green thing Amma? Mom: Its spinach. I am making spinach curry for tonight’s dinner. Me: Eww… Don’t bother! I had rather eat plain rice than eating that yucky green thing! Mom: Why don't you taste little and see if you like it. Me: I don’t want to taste it because I know I won’t like it. So why tasting it when I already know I am not gonna like it? Mom: Because it’s good for you. You’ll become strong if you eat it. Remember Popeye? He is strong because he eats spinach. Sounds familiar right? It’s still unknown as why kids preferred to get their tongues burnt than eat greens. I too grew up hating green leafy vegetables with passion and there was no way my Amma could make me eat them. Like many mothers all around the globe Amma tricked me by mixing it with Paratha, Dosa, Poories, deep fried goodies which we kids would eat happily without knowing it had greens which we hated. There was one exceptional green leafy vegetable which I grudgingly ate and yes, it’s Spinach or Palak. Reason for eating it was of course my childhood super hero Popeye, the sailor. But there was one dish which I wouldn’t have shared even with Popeye. I would happily eat it without anyone holding a gun on my temple! It is classic Punjabi dish Saag Paneer or Palak Paneer. Soft paneer cubes dunked in creamy, lightly spiced spinach gravy has to be one of the most liked side dish in Indian restaurants. It is mildly spiced and hence loved by people of all age groups from 8 to 80. As Paneer is little heavy on tummy and waist, I substituted it with Tofu to make it guilt free indulgence. Addition of cashews gives very creamy consistency for Palak gravy and makes it stand apart from usual Saag Paneer dish (Tip picked from Indira's Palak Paneer recipe where she says she learnt it from her Punjabi neighbor Deviji). We enjoyed this creamy Palak Tofu/Saag Tofu with Mooli Parathas (recipe will be posted soon). Heat about ½ tbsp of oil in a pan and add cinnamon, green cardamom and cloves. Sauté it for few seconds and add ½ tsp of cumin seeds. When cumin seeds start to crackle add cashews and green chillies. Sauté it on medium flame till cashews turn light golden brown in colour. Mix in roughly chopped spinach, sugar and cover the lid. Cook this spinach cover for few minutes on a medium heat till it is wilted. If needed sprinkle little water in between to avoid them sticking to the pan. Cool the mixture and grind it to smooth paste with coriander leaves adding as little water as possible. Keep aside this mixture till required. Heat ½ tbsp of oil in the same pan and remaining cumin seeds. When it starts to sizzle, add finely chopped onion and sauté it for a minute. Now add ginger-garlic paste and sauté it till the raw smell disappears, about a minute. Mix in chopped tomatoes and sauté till it becomes pulpy. Add coriander powder, kitchen king masala, garam masala and kasuri methi and keep stirring till nice aroma of masala fills the kitchen, about a minute time. Mix in ground spinach paste and add about 1- 1½ cups of water and salt to taste. Let it cook on a low to medium flame for about ten minutes. While the spinach gravy is cooking heat little oil in a pan and placed cubed tofu pieces. Pan fry both the sides of tofu till they turn golden brown. This step is optional and can be omitted if you don’t prefer to fry tofu pieces. Add lightly fried tofu and sour cream, if using, to spinach gravy and mix well. Cook for another 5 minutes so that tofu absorbs all the flavours. Serve this Palak-Tofu/Saag-Tofu with any Indian bread of your choice and enjoy. 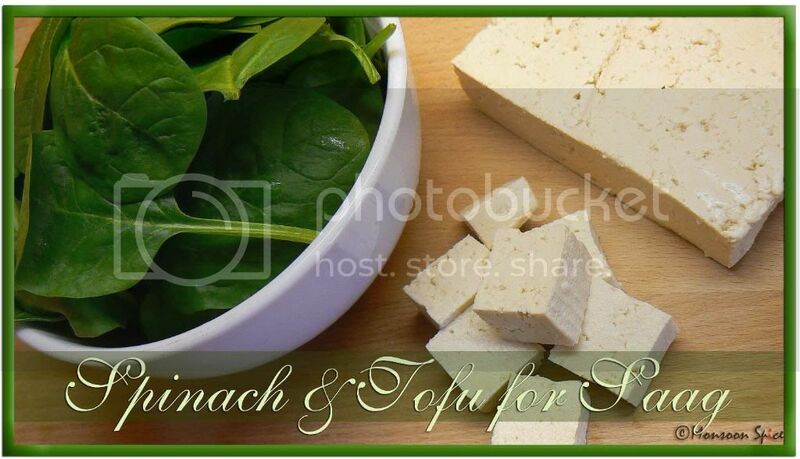 Replace Tofu with Paneer to make wholesome Palak-Paneer or Saag-Paneer. Addition of cashew is optional. I have added it to give creamy texture to the gravy. Hey Sia.. I love basale/spinach especially manglore's which i dont get it here.. nice to see that u get it there.. lovely dish..i hv tried wth paneer not tofu. great combo. I'd eat your palak just as it without tofu or paneer, it is that creamy good! Love the mouth-watering pic. Tofu and palak looks fabulous Sups, great photo. Okay, got to go now, picking up Trisha from school later and do some shopping and start decorating for tomorrow. I can't wait for Saturday 6pm, that's when they all go home! Phew!! HeHe! Oh yes, then there is whole lot of mess clean up too. Lovely colour......all your pics are absolutely drool-worthy. OOoooo wow a healthy version of Palak Paneer. For whatever reason I end up using tofu in Asian (oriental) stirfry coz I'm a lil hesitant about using it in Indian meals but this definitely looks delectable :o) Great pic btw. Wonderful pictures, Sia! Mmm. looks soooo mouth-watering as usual. Love it. Greens and Kids :) For me it is not the green but the Tofu, not fully friends yet. The curry looks delicious, if you had not mentioned they were Tofu wouldn;t have guessed. That conversation sounded so similar! :-) I had also always hated that yucky green thing :-) but began to develop a likeness to it as i grew up, for its health benefits, especially for a girl, as it has got lots of Iron, very very essential for girls! The pictures like always are awesome! Gr8 work! Same with my children too..all my kids wonder is that why this foolish mom wants to spoil those yummy tofu or paneer chunks (mostly)by dipping into that yucky green paste :)..
Sia, I make palak tofu using firm or even soft tofu. I don't pan fry 'em, but add directly to the gravy and simmer for 5 mins. This way the tofu absorbs the gravy better. I do the same with paneer too. When pan fried, I feel they lose their texture. Just a suggestion. My son who hates most indian food will tolerate saag paneer too. We make a similar recipe weekly to get his greens. 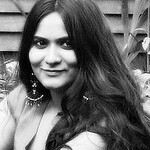 I use Queso Fresco http://jugalbandi.info/2007/08/the-perfect-paneer-substitute/ instead of tofu as I like its soft creaminess better. I can't wait to see your hubby cook up those TR muffins. :) Please post some pictures will ya? I can see a Stuffed paratha parade is already started here :)) . Oh got to post one more potato dish I made for you , thanks for reminder at the end of post :) . sometimes i feel liek it i don't check calender I might miss to post for my own event too :)) . Btw, just posted soup for you sups :D.
have a fun weekend, dear. These look awesome..have some tofu in the fridge..Will try this soon. Pictures are mouth watering, my hubby loves palak paneer, have to try with tofu once. I always add some nuts to palak, without it I can't get the right consisitancy. 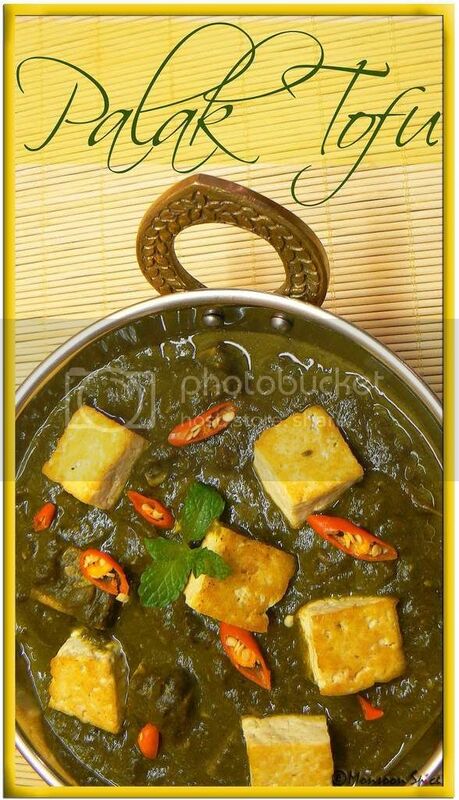 Palak Tofu looks delicious, Sia..I enjoyed visiting your blog.. 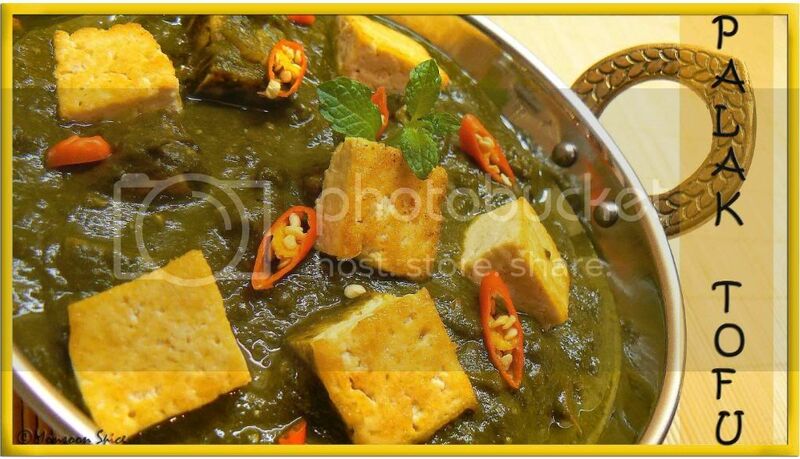 I love your photography..
That's one yummy looking Palak tofu Sia! I can't believe I have missed 2 potato events without a decent entry.. but that's the fact - sorry. Can't wait for another yummy potato round-up. What I like about tofu is that it doesn't harden like paneer after being stored in the fridge. Love the 'green'chillies in your recipe - heh heh, just like the green chillies I have! you know what I have said the same thing about popeye..for my palak paneer post...tofu is a great twist...the bowl looks yummy! one question thou.. where do u buy the tofu?? is there a brand that u prefer?? Sia...Palak Tofu looks Great with all those decors you have made..
i never liked the restaurant palak paneer, but this one looks delicious. somehow my daughter loves paneer with all the gravies and palak is her fave.....awesome pics sia!! I love Palak tofu.... The color is so vibrant Sia. Such a healthy dish ,nicely made combination to make kids eat! i dont usually fry tofu and i have noted it in recipe direction. this was the first time i fried them for a while just to confuse my hubby;) i do agree that frying loses its texture and taste but as i fried it slightly just to get that golden colour it was not that bad. tofu is available at most of the super markets in refrigerator section. i buy a brand called cloudaron which sells organic tofu. and tofu is very reasonable compared to paneer and again tastes much better than Panner and also has minimal fat. Tempting pics Sia!! Feels like it right now from ur pics, as i'm hungry yet to have my lunch :) !! Never tried Tofu.. Is it the same taste as paneer ?? mmm... nopr, tofu doesn't taste like paneer. paneer is quite smooth in texture and has this creamy, milky taste where r tofu is very soft in texture. heck, its difficult to explain how it tastes:) try it archy. i have alomost stopped useing paneer since i tried substituting it with tofu. i too was bit not sure when i tried substituting paneer with tofu for the first time in indian cuisine but now i hardly use paneer. i cant recall when was the last time i used paneer in cooking!!! that DOES look good, Sia....but I can't get past it...tried to like tofu, but I just can't......! I ain't a lover of cooking, but purely cook to keep going. I have been preparing palak paneer since the past three years, yet have enjoyed it just a couple of times. I wanted to find out why my dish never seemd flavoured enough to eat. Then finally dawn arrived when I googled upon your site to find out the missing ingredients...that morning as I went through this recipe, I had exactly 25 mins to cook and rush to work. I started out at once. I decreased the qty of cardamon and cloves, minused the cream, kasuri methi, and kitchen king masala. Instead added a tsp of bottled goa red masala. As it was cooking, it filled the kitchen with a sweet savoury fragrance. I couldn't wait for lunch to arrive. I like the lovely green colour, the seet flavour, and tanginess of the gravy. Thank you so much for this great recipe and helping this struggler to cook delicious palk paneer. Thanks for sharing the recipe, I use this one everytime I cook saag paneer (tofu). Finally one with cloves and cinnamon! All the other recipes I found online are missing it. It's not easy to get paneer here (closest indian shop is quite far) and also, I'm on a diet so the tofu version is perfect for me. I love palak paneer and wanted to see if I could make it myself. I was very pleased with how it came out, though in retrospect I would have added a bit more spice and salt. I also wish, before going to the store, that I had looked up "kasuri methi" and discovered it was fenugreek. Oh, well, I will just have to make it again!